Overuse injuries develop over time, and may set in more quickly if you spend long hours sitting at a computer at home, as well as at work.To protect your neck and back, wear the Posture Medic to stabilise when stilling at your computer for more than 20 minutes at a time. Symptoms can include numbness in the fingers, sore wrists, lower back pain, or eyestrain (redness, dryness, soreness, temporary blurring of vision, and headaches). You may also develop general aches and pains in you neck, shoulders, arms, back, thighs, and lower legs (postural fatigue). There is also a risk of developing persistent pain or discomfort in your muscles, tendons, and other soft tissue (repetitive strain injury). You are more productive and efficient at a workstation that fits your body size. 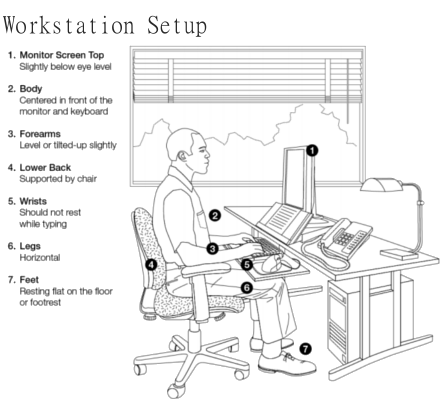 The ideal workstation lets you work in a natural (neutral) posture that minimizes strain on your body. 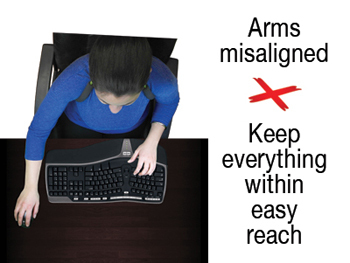 A mismatched workstation forces your body into uncomfortable postures such as hunching over, slouching, straining, or twisting. Many people find that a good chair is one that adapts to their bodies. You need to choose a chair that is stable and has adjustable height and chair tilt. Consider a chair with a backrest that supports the curve of your lower back (lumbar region). If your chair doesn't have lumbar support, you can get a separate back rest to make your chair more comfortable. 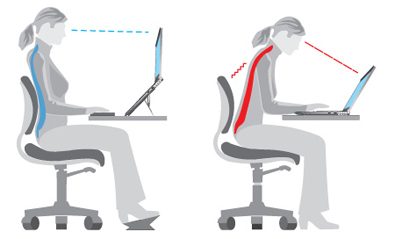 Be sure to sit back in your chair when you work at your computer, this way your spine is supported. Position your thighs horizontally with your knees at about the same level as your hips. Rest your feet comfortably on the floor or on a footrest if you need one. Consider a base with at least 5 points that rolls on wheels (casters). Most people are comfortable when the height of their desk is at elbow level when sitting down. Check that there is enough room below the work surface to comfortably fit your knees and thighs. Consider having the height of the surface holding your keyboard and mouse or trackball about 1 to 2 inches above your thighs. Centre the keyboard in front of your body. About one arm’s length (20 to 26 inches) in front of your head. With the top of the viewing screen at eye level so you can see it clearly without looking up or down. Set up your workstation away from sources of glare such as windows. Use a headset if you talk on the phone and type at the same time. Spine: Ears are in line with the tops of shoulders, and your shoulders are in line with hips. 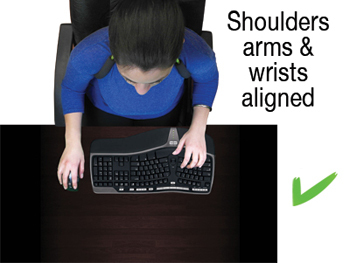 Wearing the Posture Medic helps keep your head, neck and shoulders in line when working at your desk. You will be more comfortable while preventing chronic injuries from developing. Relax your fingers and hands between bursts of typing. 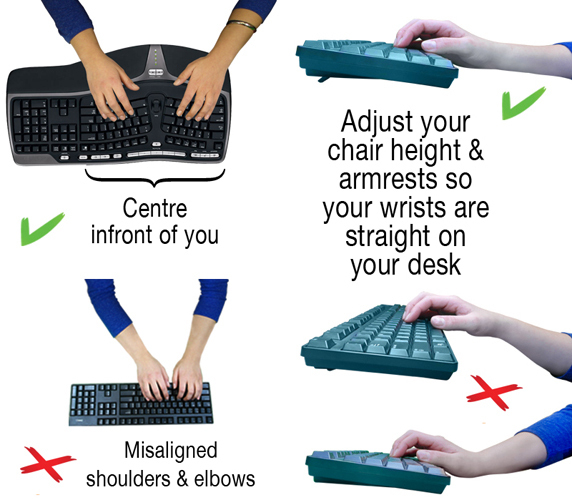 Use your mouse with a flat, straight wrist posture. Some individuals may find the design of a laptop computer is inherently problematic because the screen and keyboard are not in separate places. When you use a laptop, your either bend your head and neck to see the screen, or you hold your hands and wrists improperly to use the keyboard. If you use a laptop frequently, consider buying an external monitor to improve your workstation set-up. Alternatively, you can get a stand to view the screen at the correct height and type using an external keyboard. For occasional use, place the computer in your lap for the most neutral wrist posture and comfort. Be sure to take breaks and stretch your neck and shoulders so that they don't get too stiff. 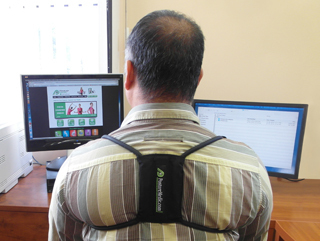 Wear the Posture Medic to help maintain proper posture.